New alignment technology, advanced engineering, and bold new design at a lower price that is out of this world! 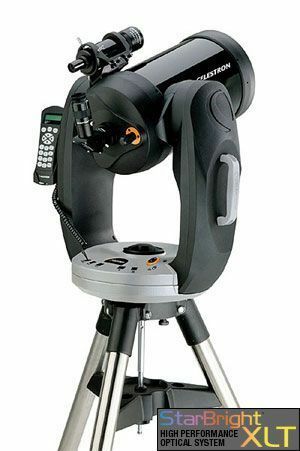 Celestron's Professional Computerized (CPC) Series with revolutionary SkyAlign Alignment Technology re-defines everything that amateur astronomers are looking for - quick and simple alignment, GPS, unsurpassed optical quality, ease of set-up and use, ergonomics, enhanced computerization and, most important, affordability. The CPC Series internal GPS receiver automatically downloads the date and time from orbiting satellites and pinpoints its exact location on Earth. This eliminates the need for you to manually enter the date, time, longitude and latitude. Once the CPC's internal GPS has established the telescopes position, aligning the telescope is as easy as 1-2-3! Simply locate and manually point (slew) the telescope to three bright celestial objects. You do not need to know the names of the stars - you may even pick the moon or bright planets! Celestron's NexStar software technology will model the night sky to determine the position of every star, planet and celestial object above the horizon. Once aligned, the remote hand control allows direct access to each of the celestial catalogs in its user-friendly database. Celestial Object Database The CPC database contains over 40,000 celestial objects including Messier objects, the Caldwell Catalog, as well as NGC Galaxies, nebulae and planets. User-definable filter limits make navigating through this expansive database quicker and easier. When using the "filter limits" feature, only those objects that are above the horizon are displayed for your exact date, time and location. The new CPC Series telescopes, like the acclaimed Advanced Series and premium CGE Series telescopes feature meticulously matched and hand-figured optical systems that are manufactured in Celestron's facilities in Torrance, California. In addition, all CPC models are supplied with StarBright XLT High Performance Optical Coatings. With the introduction of the CPC Series, Celestron has "gone back to the drawing board" and re-designed, re-engineered, and re-invented a telescope family that provides superior quality, unsurpassed ease of use, and incomparable value. All CPC models ship standard with the NexRemote telescope control software. The CPC series telescopes include the NexRemote software so the telescope can be set up and operated remotely from a PC or laptop! NexRemote duplicates all of the functions and features of the NexStar software on the standard NexStar Hand Control plus much more! Re-designed drive base and drive mechanics - quite operation; large drive gears, quick release clutch; Auxiliary ports for AutoGuider, PC; easily mounts to tripod. Newly designed tripod - Heavy-duty steel tripod with accessory tray, center leg support bracket for rock solid stability, spring-loaded mounting screws and recessed mounting platform for quick setup.